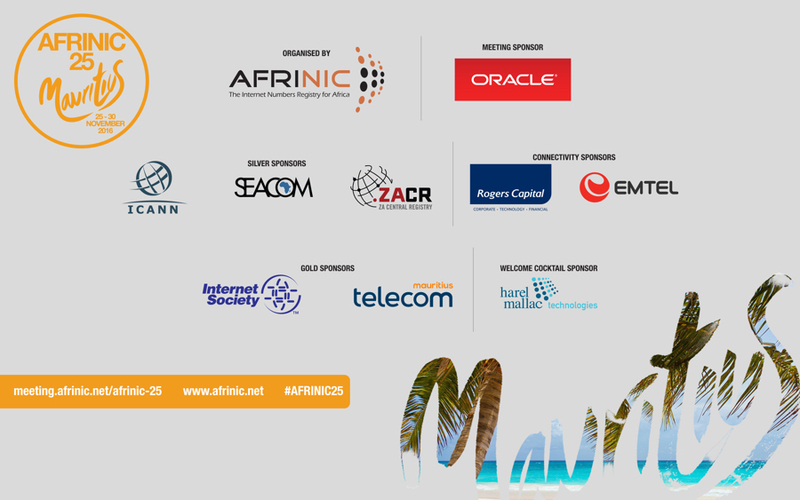 AFRINIC-25 took place in Flic-en-Flac Mauritius, from 25 - 30 November, 2016. Around 240 people from 47 countries took part in training sessions, workshops, tutorials, policy development discussions, plenary sessions, elections and networking events. The meeting was organised by AFRINIC. We would like to extend our heartfelt thanks to our sponsors, partners and donors, and the attendees. We look forward to seeing you all in Nairobi, Kenya, for the AIS'17 and AFRINIC-26, from 21 May - 2 June 2017. The AFRINIC-25 meeting saw several fascinating presentations on a wide variety of topics including IPv6 deployment in Africa, AFRINIC's new IPv6 certification platform, Certi::6, Mauritius' Critical Information Infrastructure Protection Framework and latency clusters in the region. The full agenda can be found here. Click on the Info section to see the presentation slides. The session recordings (28 - 30 November only) can be found here. Over 240 people attended the meeting, with more than half (51%) of attendees being first time meeting attendees. 27 African nations were represented alongside 20 other economies from around the world. More detailed meeting statistics can be found here. Detailed Daily Recaps of each day's events were published each day and can be found here.